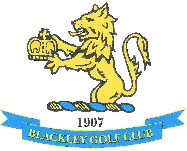 Wednesday 7th June saw the 2017 Seniors Open take place at Blackley Golf Club. We were especially grateful for the wet weather relenting for a day, although the winds were a bit too strong, causing a quick bit of tree surgery before play could begin. Visitors to the club were extremely complimentary about the course thanks go out to the ground staff, whose work over winter on the drainage looks to be paying off. Numbers were down slightly on previous years but nonetheless 41 pairs took part and the result was a close run thing. Four teams finished with 42 points and the dreaded card playoff came into use, but the winning team came in with an excellent 45 points. Chris Stuttard for his sterling work as starter. Denise Foulner and Barbara Cleary who manned the refreshment tent ( although the wind prevented the tent being put in place so they had to battle the elements). Look forward to seeing you all next year, or even the Turkey Shoot on 18th October.